I know it’s the New Year and everyone is going to expect this to be a saccharine sweet post about family, traditions, and food. And I have plenty of entertaining stories about my family—and my family’s traditions with food! 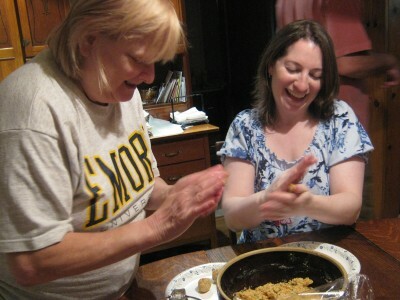 Just ask Karen Falk what she learned about the Okin clan’s food traditions during her research for Chosen Food. But that will have to be another post. 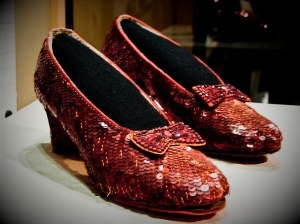 And this isn’t a post about a girl from Kansas with some sparkly shoes, either. This is really about the satisfaction of crossing something off my to-do list and feeling like I’ve done a mitzvah at the same time. Now Avi would joke that crossing anything off my to-do list is a mitzvah since the list is currently about 26 pages long. He might be right: I think that this was actually one of the very first things that I put on my to-do list when I started as a part-time curatorial assistant over a decade ago. A sample page from my to-do list of epic proportions. 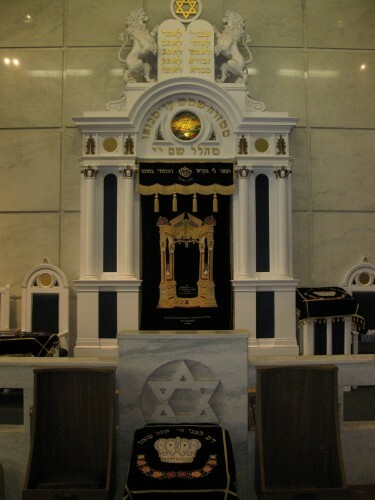 In 1998 The Jewish Museum of Maryland purchased a pinkas (congregational record book) belonging to the Kesher Israel Congregation of Harrisburg, PA.For a brief history of the congregation click here. Shortly thereafter acquiring the pinkas, the Museum revised its mission statement with a clear concentration on the history, traditions and culture of Jewish life inMaryland, rather thanMaryland and its surrounding areas. The book was never approved for accession, and in 2001 I tried to find a suitable repository for it. My calls, letters, and pleas brought no response from any of the institutions I contacted. The book remained in its acid free box on the shelf downstairs. The collections staff would look at it and sigh. Every few years I (or my interns) would try again to find a home for it, but never with any luck. 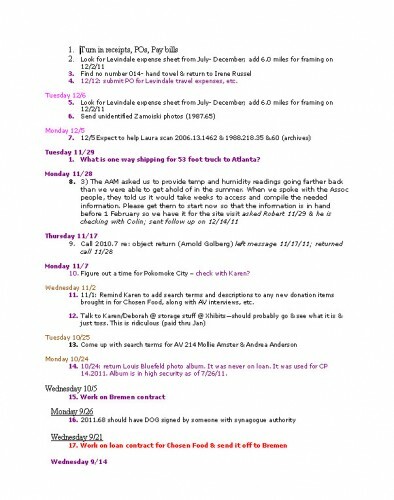 But this year an e-mail was answered: the congregation wanted it back! So on a cold, rainy Tuesday before Thanksgiving I drove up to Harrisburgto hand-deliver the pinkas. When I arrived, a Thanksgiving dinner was in full swing! It was a wonderful to see the members enjoying their extended family. I didn’t have a chance to meet Rabbi Akiva Males, but he’s assured me that when the book is translated he will share the information with the congregants. The Collections Staff is thrilled that the pinkas has finally found its way home. I am a long time member of Kesher Israel Congregation in Harrisburg, PA. I was just wondering why it seemed to be so difficult to return the Pinkas to our Congregation. 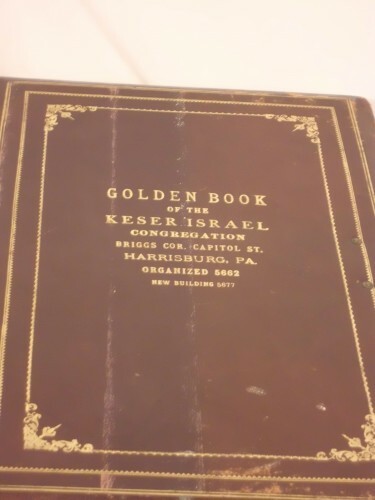 The cover says it is the Pinkas of Kesher Israel of Harrisburg, PA. A simple Google check would have given the information that we were still in existence. We did indeed know that the pinkas came from Kesher Israel Congregation. Naturally, the Congregation was the first institution that I contacted in 2001. I am not sure of the circumstances surrounding the reason the pinkas was given away (or possibly sold) in the first place, but a decade ago there was no interest in having the book returned. Fortunately, the JMM remained committed to finding the right repository for the book –and happily Rabbi Males saw the value in having it returned. The JMM is delighted to reconnect Kesher Israel with their historical artifact.